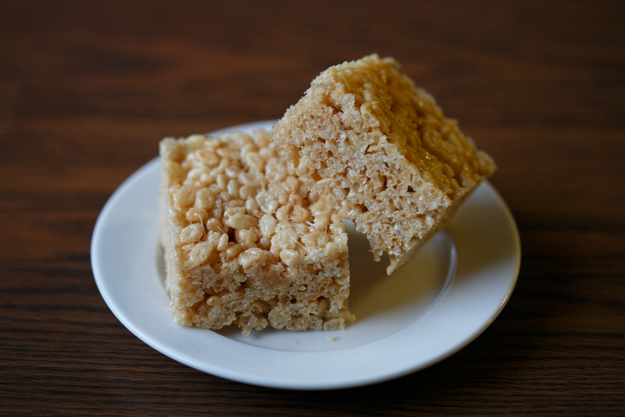 Rice Krispie Treats are one of my all time favorite treats. When I was kid, my mom would always make or buy them from the store and the majority of the time, I would get in trouble for eating too many. I came across this recipe for Caramelized Brown Butter Rice Krispie Treats which uses exactly the same ingredients as your typical recipe, but with a twist. I'm not a big fan of adding extras like M&M's to my Rice Krispie Treats, even though Ash always wants to mix them in, so this recipe is the perfect variation of the recipe we all know and love while still keeping things classic. 1. In large pot melt butter over medium-low heat. It will melt, then foam, then turn clear golden and finally start to turn brown. Make sure you watch closely and stir often. 2. When butter is browned evenly, stir in marshmallows. Melt and cook, stirring often, until mixture turns pale brown, then stir constantly until browned but not dark, this will take 3 to 5 mins. 3. Turn off heat, add rice krispies and mix well. Scrape into a pan already lined with parchment paper or wax paper and press down lightly. Let cool and cut into squares. Ooooooh, the brown butter twist sounds fabulous!! !